According to their own website, they are the founding fathers and absolute rulers of the neo-swing movement,? the reigning kings of all that is sartorially and otherwise splendid in classic American music. They hit their big break in the mass-media with Hey Pachuco! used in the 1994 movie "The Mask" (it's the music Jim Carrey dances to with Cameron Diaz). Since 1991, they have released four studio albums and three live albums. They are based in Los Angeles, and frequently tour in the L.A. area, around the United States, and around the world. Since 1991, they have released four studio albums and three live albums. They are based in Los Angeles, and frequently tour in the L.A. area, around the United States, and around the world. 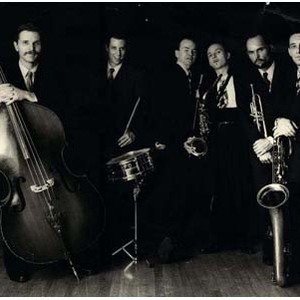 The band line is Eddie Nichols (vocals), Mando Dorame (tenor sax), Jim Jedeikin (bari/alto sax), Scott Steen (trumpet), Mark Cally (guitar), Dave Miller (bass) and Daniel Glass (drums).